Quercetin has a good expectorant, cough effect, and have some asthma, for the treatment of chronic bronchitis. 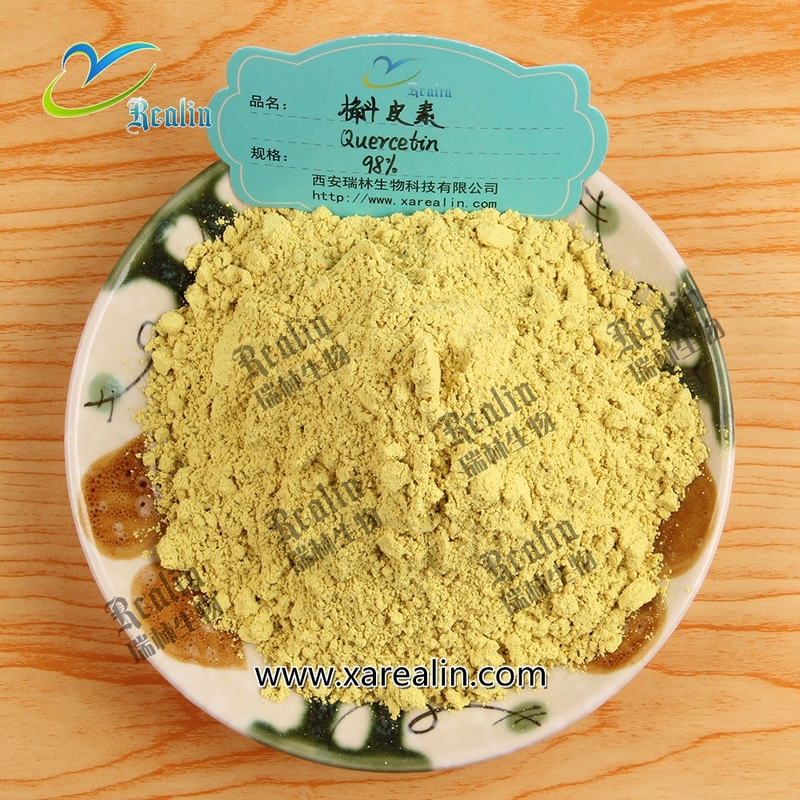 There are also lower blood pressure, increased capillary resistance, reduce capillary fragility, blood fat, expansion of coronary artery, increase coronary blood flow effect on coronary heart disease and hypertension in patients with adjuvant therapy. 2.Quercetin is also used for diabetes, cataracts, hay fever, peptic ulcer, schizophrenia, inflammation, asthma, gout, viral infections, chronic fatigue syndrome(CFS), preventing cancer and for treating chronic infections of the prostate. 3.Quercetin is also used to increase endurance and improve athletic performance. Allergies, asthma, and hives: Quercetin may inhibit histamine release from basophils (a type of white blood cell) and mast cells (large cells in connective tissue). Canker sores: Quercetin may reduce the frequency of mouth sores and produce mild symptomatic relief. Heart disease: Individuals with very low intakes of flavonoids are at higher risk for heart disease. Infection: Quercetin may control the spread of certain viruses within the body. Rheumatoid arthritis: Quercetin may help reduce tissue destruction. Quercetin may also be beneficial in the treatment of dysentery (an intestinal infection causing severe diarrhea), gout (a disease where crystals of uric acid, a component of urine, are deposited in the joints and cause swelling), and psoriasis (a chronic skin disease).